Hey Kids, Comics! : True-Life Tales from the Spinner Rack edited by Rob Kelly shares stories of a day long gone, when comics were hunted down and purchased from gas stations and mail order instead of direct market stores and Ebay. For some readers, this is a time happily remembered. For others this is a time that seems as fictional as our comic book heroes. Hey Kids, Comics! Collects over 35 short essays centering on each author’s love of comics. The contributors include those whose love turned to vocation in comic creators like Steve Englehart, comic book bloggers and comic book fans who have been inspired by their heroes. Among the many stories that stuck out to me are “Blood the Page” by Richard Harland Smith which notes that superhero stories are tales of transformation, a theme which strikes a chord for me in my own comic reading. “Steel-Hard Skin” by Evan Narcisse discusses how comics helped foster the strength of identity while he was growing up, an African-American in a Caucasian world. “The Field” by Tim Neenan is heartbreaking and real as Neenan explains how comic books served as a connection to his brother. And as a parent I resonated to “No Careless Product of Wild Imagination…” by Chad Nance as he discusses passing his love of comics down to his children today. The period covered in this book is one I remember well. During my prime comic collecting days, most of my issues were purchased with change from “Mini-Mart.” This meant that the selection and release dates were always questionable. So to complete arcs I had to search a number of drug stores and other gas stations hoping they might have the books I needed. A few times I did convince my parents to allow me to order a some books via mail order. Honestly today between direct market and online shopping there is no recently released book I cannot get my hands on. You could not get the 3D cover of Joker #1, no worries for me since my Local Comic Shop had plenty. So for me since I remember this time and collected in the age of the spinner rack, Hey Kids, Comics! is a nostalgic trip to my past for me. For other younger readers this book is a chronicle of a time in comic history that has now passed. There are several themes that reoccur in many of these stories, with these being just a few. First, in the days of the spinner racks there was the joy of the hunt for fans. With selection and quantity varying from location to location, the comic fan was constantly chasing and pursuing their prey. And when one found a big score it was a joy. Second, for most fans collecting is about enjoying and reading. Few of the contributors, and rightfully so, saw their collecting as a financial investment. Comic fans typically purchase comics to read and enjoy them. Third, mom and dad were often the enemy. Many stories include that parents tossed out collections as they took over their home. Luckily for me I still have almost all of my childhood books. And finally, there is passion. The contributors all speak of the passion they had for not just their books but the actual pursuit of them. Hey Kids, Comics! 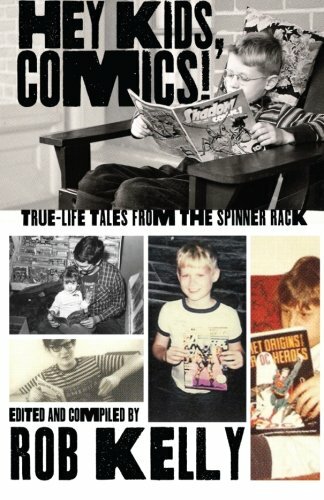 : True-Life Tales from the Spinner Rack is a book for and by comic fans. It is a historical record of a time when comics were readily available, though in small numbers, at corner stores and gas stations. I personally miss the days of seeing a spinner rack with its manhandled comics when I enter convenience stores. My kids will never know the joy of finding that Manhunter #4 is actually on the spinner. And if you wish to reminiscence on those bygone days, this book is for you. Disclaimers: Review Copy Provided for Purposes of Review. Agent Daniel and Agent Ben are both listeners to Mr. Kelly’s The Fire and Water Podcast and are members of Friends of Aquaman (FOAM) founded by Mr. Kelly.